Ace Hoffman's Nuclear Failures Reports: At San Onofre, "fluid elastic instability" is a fancy term for "busted"
At San Onofre, "fluid elastic instability" is a fancy term for "busted"
San Onofre Nuclear (Waste) Generating Station has been shut down for nearly six months, ever since one of the heat transfer tubes inside their new steam generators in Reactor Unit 3 ruptured suddenly and unexpectedly. The normal pressure difference from one side of the tube to the other is enormous: About 1,000 pounds per square inch, so even a tiny leak spews many gallons of "primary coolant" (which is highly radioactive) into the "secondary coolant loop" (which, ideally, is not radioactive at all). When a leak occurs, the primary coolant flashes to steam as it exits the broken tube, and the steam is so hot it can cut through the tube like a welder's torch, eventually cutting a complete circle around the tube, releasing it to fling around and damage other tubes. There are nearly 10,000 U-shaped heat transfer tubes inside each steam generator. They are about the thickness of a credit card and the diameter of your thumb. Reactor Unit 2 was already shut down for massive repairs and refueling when Unit 3 sprang a leak. Neither unit has operated since then (and the lights have remained on. We do not need San Onofre). An older reactor, Reactor Unit 1, was retired 20 years ago for basically the same reason, and has since been dismantled. It's time to dismantle Units 2 and 3, too. SanO's majority owner and operator, Southern California Edison, recently claimed to have identified the cause of Unit 3's current problem as "fluid elastic instability". And although Unit 2 is of identical design and also has two new steam generators which are also experiencing excessive wear, SCE claims Unit 2 will not suffer the same problem if they restart it at reduced power. SCE wants to do that next month, probably at half power, which does NOT mean the pressure differences and flow rates are half as much, because efficiency drops off substantially when the plant is not run at its maximum practical output (and so do profits for SCE!). If Unit 2 runs without problems, they'll bump the power up to 60%, then 70% and then 80%. (So far that's as high as they've said they'll dare to go.) Then they'll start talking about restarting Unit 3 at reduced power as well. Restarting either SanO unit should be opposed by everyone in Southern California. It's not worth the risk. Fluid elastic instability was first identified around 1970 and occurs when a fluid -- usually a steam/water mixture (in this case mostly steam) flows across a bundle of tubes. In the case of San Onofre, the steam/water mixture traverses the tubes at the U-portion of the tubes at their top. A cascade of tube failures is substantially more likely under fluid elastic instability conditions than most other tube-rupture scenarios. If a cascading tube failure occurs, the fact that SanO's design has only two steam generators (whereas most Pressurized Water Reactors (PWRs) have three or four) becomes an additional serious liability: The second (only remaining) steam generator has to remove ALL the heat from the reactor. Debris from the first steam generator failure may further complicate matters. SCE was very reluctant to admit they've got a fluid elastic instability problem, and when they made a presentation to the Southern California Association of Governments (SCAG) last week, they didn't try to explain what fluid elastic instability is. They just said that it was apparently the problem. However, the phenomenon is described in a 2001 ASME handbook on flow induced vibrations by M. K. Au-Yang: Upon crossing the "critical velocity" the tube vibrations "suddenly rapidly increase without bound, until tube-to-tube impacting or other non-linear effects limit the tube motions." The vibrations: "become correlated and bear definite phase relationship to one another..."
In other words, the tubes rock back and forth together like people doing "the wave" or some other motion in a stadium. Fluid elastic instability is difficult to model using computer simulations and SCE did not do full-scale modeling of the new steam generator design. They also skipped full-scale hot testing after installing the new steam generators in 2010 and 2011. When a tube started to leak in January 2012, the reactor operators did NOT suspect fluid elastic instability, and did NOT do the immediate prudent thing: Shut down the reactor. Instead, they kept running at full power until it was determined that the leak was growing -- always a bad sign. Permitted leakage rates, and total amounts, would have both soon been exceeded. Normally, when the reactor is shut down for routine maintenance, faulty tubes are plugged. This process continues for the life of the plant or until so many tubes are plugged that the steam generators have to be replaced. When the plant was built, it was believed that the steam generators would last the full life expectancy of the plant. But throughout the nuclear industry, replacing steam generators has become a huge business. Fluid elastic instability is relatively rare but is much more frightening than a typical steam generator tube leak. Some leaks are left to spew, because rather than grow, they clog up with crud and stop spreading. But growing leaks cannot be ignored. Of the nearly 40,000 tubes inside the four new steam generators in the two operating reactors at San Onofre, more than 1,300 were found to have excessive wear to such a degree that they needed to be plugged. About 10% of those were pressure-tested before being plugged, and eight failed the pressure tests -- some failed at pressures BELOW standard operating pressure! SCE officials are very reluctant to say how many tubes have failed in Unit 2, stressing that "only two" tubes indicated tube-to-tube wear, which, they feel, was probably caused by turbulence, not fluid elastic instability. They aren't certain, though, and just because fluid elastic instability hasn't been experienced in Unit 2 yet, doesn't mean it can't happen there, either under normal operating conditions or during an emergency. SCE has no idea when fluid elastic instability might occur. Their computer models are known to have been off by 300 to 400 percent. Flow rates are known to be way too high, and there is way too much steam and not nearly enough water at the top of the tubes (a mixture with more water would have been much better at dampening vibration). Maybe SCE is right that lowering the power output will ensure safe operation. But what if they're wrong? SCE wants to experiment with all our lives. And let's say they succeed. Let's say they get the reactors operating again. Then, they will just go back to producing more spent fuel nuclear waste, a growing problem for which there is still no solution. It will mean the next time there is an earthquake or a tsunami, San Onofre will threaten our farmlands, our cities, and our lives once again. It will mean San Onofre will continue to threaten SoCal at least until the NRC relicenses the plant in 2022/2023, and then for 20 more years after that (and so on ad infinitum). The NRC has never denied a nuclear power plant a license renewal in its history, and is especially unlikely to do so in California where new nuclear power plants are forbidden by state law. San Onofre is shut down today because it was poorly designed, poorly constructed, and poorly operated. Let's keep it shut down. It's not going to get any better. The author, an educational software developer, has been observing San Onofre's follies for more than 20 years, since moving to California from Connecticut. He has studied the nuclear industries' follies for about 40 years. 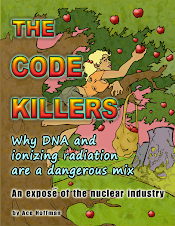 His book, The Code Killers, written in 2008, is available for free download from his web site: www.acehoffman.org . For ease of reading, I suggest putting the text in black on white back ground. Your information is so important, the easier it is to read, the more it will be.